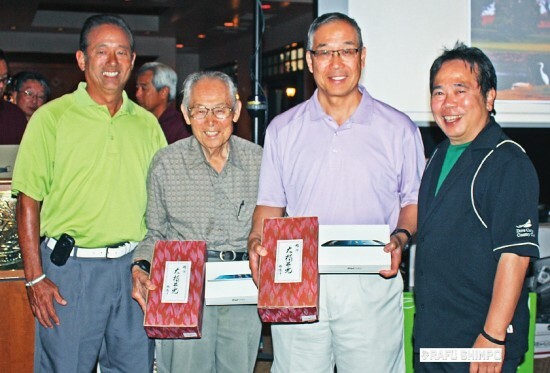 The Rafu Shimpo Foundation’s 2014 Charity Golf Classic was played April 7 with more than 130 golfers taking part. The event, held at South Hills Country Club in West Covina, benefited the Little Tokyo Community Council, the Little Tokyo Public Safety Asso­ciation, the Nisei Week Foundation, the Nikkei Games and the Nikkei Federation. When all the rounds were finished and the golfers were back in the clubhouse, Mark Komoda turned in the lowest gross score, a cool 75 for the 18 holes. George Sugimoto carded the lowest net score with a 63, and Don Nose topped the Callaway Flight with a 71.